OK, in a previous post, I said how pleasant it is it to eat and drink seasonally. Well, I guess when the highly-praised, revolutionary Daiya vegan cheese FINALLY makes it to Albany, I throw that philosophy out the window. I have no idea what its origins are, but, ever since I heard a local beeradvocate friend mention making beer-cheese soup with leftover beer from tastings, I’ve wanted to give it a shot. 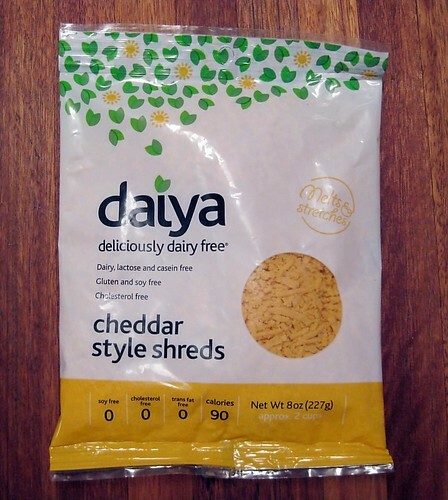 Although it’s about four months too late for a hefty soup like this, the Daiya cheddar called out to me. So, after doing some research on the web, I’ve come up with the following veganized recipe, which you should try making when it’s depressingly cold outside. It brings you happiness like only fat and beer can. 1 batch of Isa’s chorizo sausage sliced into 1/2″ rounds and sauted until brown, or 1 package Soyrizo smokey sausage. Heat a stockpot over medium heat and add the earth balance. Add chopped onion, carrot, and celery and saute until softened (about 10 minutes). Add flour and mix into onion, carrots and celery. Cook for about 5 minutes, stirring often. Add the broth and beer. Heat until it comes to a boil, then add the Daiya while stirring. Just as it’s coming to a boil again, add cashew cream, almond milk, salt, dry mustard, and Worcestershire sauce. Reduce heat to low and cook until thickened. Add sausage to the soup and let it cook another 5 minutes. 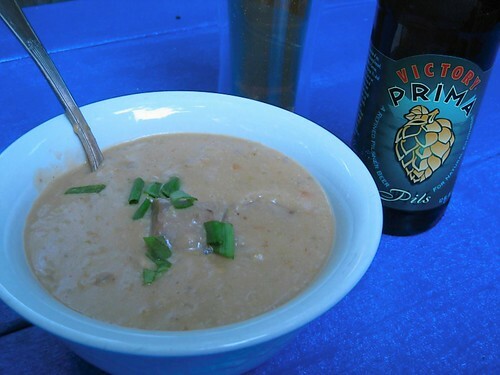 To make eating hot soup on a warm, late-spring night more comfortable, I washed it down with a cold Victory Prima Pils outside on the deck. The soup was savory decadence. Extremely rich and creamy, with an unbelievable cheesy flavor. Also noteworthy was how much the beer really came through. The citrusy hop flavor and aroma detectable through the dense cheesy, smokey flavors truly showcases the wonderful product Troegs gets with the use of their hopback. Excellent pairing of outstanding beer and amazing vegan cheese.